features reduce handling and set-up costs, reduces maintenance costs and improve accessibility of expendable parts, while generating long-life and economical maintenance. *For these applications consult the factory for ratings. water well drilling applications to well service applications. (BHP) (In.) (In.) Min. Max. Min. Max. recovery, as well as carbon steel for pipeline testing, water-blast and hydrocarbon services. testing, gunniting cude oil transmission and slush service. Pressure (PSI) (In.) (In.) Min. Max. Max. the specific demands of almost every application. surpass the rugged demands of the petroleum service industry. acidizing units and stimulation equipment. while offering the highest rod load to weight ratios available. be truck, skid and trailer mounted for deployment in some of the harshest environments. shafts to meet your needs. Replacement Parts and Repair Service Genuine Gardner Denver, OPI, GeoQuip and Chaparral Replacement Parts Expendable parts manufactured to original specifications from the people who have been making pumps tougher for over 100 years. When you need replacement parts for your pump, insist in genuine Gardner Denver., OPI.,GeoQuip. and Chaparral. products. Our pump products have served the petroleum and industrial markets dependably for decades. You know you can trust Gardner Denver parts because they are designed and quality checked to rigid specifications by the same engineers and craftsmen who design and build our pumps. Our factories utilize state-of-the-art manufacturing methods, highly efficient equipment and highly skilled craftsmen allowing Gardner Denver to produce a high quality product at very competitive prices. You can also feel confident that our products have been field tested to assure performance, long life and trouble-free operation. Our service begins close to you with five strategically located warehouses and a network of over 100 authorized distributors committed to stocking the parts you need ― when you need them. Plus, a ready supply to assure you of fast delivery. Who better to repair your pump than the company you bought it from in the frist place. 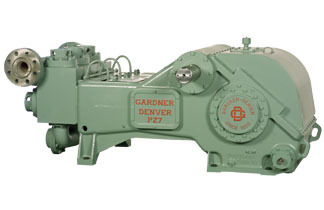 Gardner Denver offers you two locations dedicated to rebuilding, remanufacturing or repairing your pump power end, fluid end, or complete pump assembly. Highly-trained technicians will remove, repair and test your pump in a shop designed to get your unit back to work as quickly as possible. Supported with a full-line of original Gardner Denver parts, our Ft. Worth, Texas, and Odessa, Texas, are logistically located to expedite repairs to factory specifications.